Six dead as massive fire engulfs London tower block – Royal Times of Nigeria. 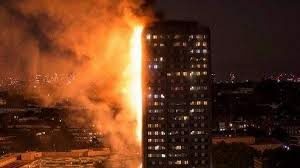 A massive fire which engulfed a London tower block in the early hours of Wednesday has killed six people, London Metropolitan police has said. Not less than fifty people have been hospitalised. London fire commissioner, Dany Cotton, had earlier confirmed that there were a “number of fatalities”. Hundreds of people reside in the 24-storey Grenfell Tower in north Kensington. Several persons are reportedly unaccounted for while some are trapped in their homes as the rescue operation continues. “I am very sad to confirm that there have been a number of fatalities. I cannot confirm the number at this time due to the size and complexity of this building. It would clearly be wrong for me to speculate further. Equally the cause of this fire is not known at this stage,” she said in a statement. Hundreds of people reside in the 24-storey Grenfell Tower in north Kensington. Several persons are reportedly unaccounted for while some are trapped in their homes as the rescue operation continues. About forty fire engines and over 200 firefighters were deployed to the scene of the incident. Dan Daly, London Fire Brigade assistant commissioner, was quoted by the BBC as saying that firefighters are “working extremely hard in very difficult conditions to tackle this fire”. The tower block which contains 120 flats is said to have undergone a two-year, £10m refurbishment that was completed last year. A resident group reportedly issued series of warnings of the tower being a fire risk.